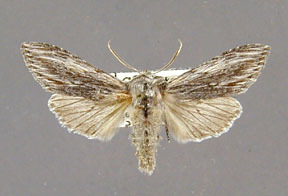 Lathosea pulla Grote, 1881, Bull. Geol. Geog. Surv. Terr., 6(2):270. 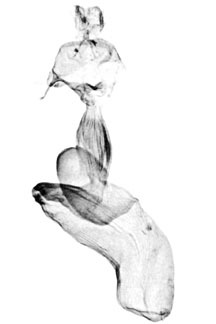 Lathosea pullata Grote, 1890, Revised Checklist of the North American Noctuidae. 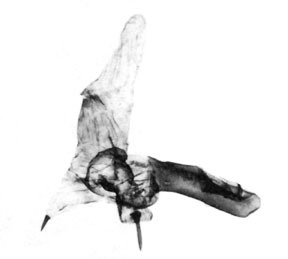 Part I. Thyatirinae Noctuinae, p. 14. NOTE: This is an unjustified emendation of Lathosea pulla, and is, therefore, a junior objective synonym of pulla with the same type and type locality. Lathosea spauldingi Barnes and Benjamin, 1922, Contrib. Nat. Hist. Lep. N. Am., 5(1):29. 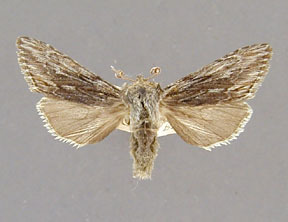 Diagnosis: Cucullia pulla is a distinctive moth with a robust, hairy, dark black appearance. Its general appearance plus the serrate to pectinate antennae of the male and a bright white hindwing fringe should readily identify it. 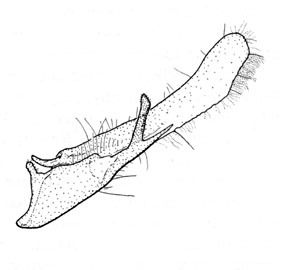 The male genitalia vary considerably within a single location and between localities, a property of many other species of Cucullia. The larvae of pulla pose a problem. Crumb (1956) divided the larvae I refer to pulla into four species, although there are two basic morphotypes in this material. The situation is confused because no voucher specimen was reared for one of Crumb's "species" and the voucher for another is missing. The genitalia preparation for his "species 2" is missing. Both the voucher and slide are present only for his "species 4". The four "species" described by Crumb fall into two basic types. In one type the larval pattern is like that of dammersi (see below), a complicated pattern of black patches between the dorsal line and the spiracles. In the other type these black patches are reduced to small lines and dots and the pattern is dominated by dorsal, subdorsal, and subspiracular lines. The head also varies in its markings from a head with conspicuous freckles of dark brown or black to a head with the markings almost totally absent. The lined form usually does not have a central black spot on each proleg, but a spot is present (as in dammersi) in the more complicated form. Three possible alternatives are; 1) there are more than one species involved, 2) the larvae are polymorphic and highly variable, or 3) one or more of these "species" may be the larva of Cucullia strigata or serraticornis. I am adopting the second hypothesis, but suggest that this problem needs to be further examined. Wing length from base to apex: mean = 20.04 mm., standard deviation = 1.00 mm., n = 10. Distribution: Cucullia pulla is distributed primarily in the low, dry montane areas of the Great Basin and Mohave Deserts. It has not been collected, as yet, in either the rest of California or Nevada. 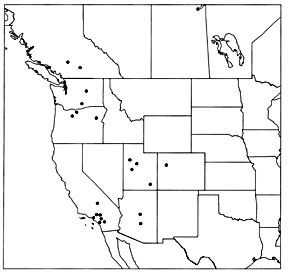 The species occurs as far east as western Colorado and as far north as eastern and central Washington. The southern limit of its range is in central Arizona. Cucullia pulla is apparently sympatric with dammersi in the Mohave Desert area. There appears to be little significant geographical variation in the species, although the Colorado and Utah specimens are a bit browner and darker than other populations of the species. There is a single specimen from Los Angeles County which is slightly smaller and grayer than other specimens from the area, but I believe it is only a dwarfed individual. The adults fly in early spring (January to March) and the larvae occur in the spring, pupating well before summer. The significance of this early flight period is unknown, but possibly the larvae feed on the newly developing foliage and avoid a significant proportion of the secondary plant chemicals found in many shrubby composites. Foodplants: Assuming Crumb's four "Lathosea species" are indeed all pulla (a voucher specimen for one Arizona larva is the only one available), the larvae feeds on Chrysothamus (rabbitbush) in Washington and Idaho and Gutierrezia wrighti and "Chrysoma laricifolia" in Arizona, all shruby composites (Asteraceae).